There are two motives for studying materials processing in centrifuges. First, such research improves our understanding of the influence of acceleration and convection on materials processing. Second, there are commercial opportunities for production of unique and improved materials that cannot be prepared under normal earth conditions or in space. Through a combination of experiments and theory, we are gaining an understanding of centrifugation on phenomena of importance to materials processing. We find that it is necessary to consider not only acceleration, but also the Corio lis effect and the variation of acceleration with position. As one consequence, the vigor of buoyancy-driven convection is sometimes increased by centrifugation and sometimes decreased. Similarly, the tendency of the convection to become unstable or oscillatory may either be increased or decreased by centrifugation. On the other hand, the observed effects of centrifugation on product quality have largely gone unexplained. 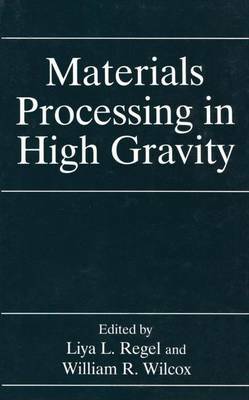 This volume constitutes the proceedings of The Second International Workshop on Materials Processing at High Gravity, hosted by Clarkson University in June of 1993. The concept for a workshop on materials processing in centrifuges was born at a series of informal meetings held in Paris in 1990. The First International Workshop on Materials Processing at High Gravity was held in May of 1991 in Dubna, USSR, on the banks of the Volga River. The proceedings of this workshop was published in 1992 as a special issue of the Journal of Crystal Growth.